Even if the best picture announcement had happened smoothly and to plan, Moonlight's win would still have been regarded as one of the biggest Oscar stories and upsets of recent times. What could have helped it to victory over La La Land, the favourite heading into the ceremony? Well, there are various factors that might, just might have come into play. Firstly, of course, Moonlight is an exceptional piece of film-making. And it may well be that its coming-of-age theme, sumptuous photography and nuanced performances simply ended up resonating more strongly with voters than any of the rival films that were also nominated for best picture. 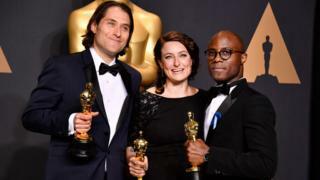 In 2016, after two years of #OscarsSoWhite, the Academy invited a large number of individuals from ethnic minority backgrounds to join and take part in voting. The Academy remains overwhelmingly white and male, although slightly less so than before. If it was a very close race, a somewhat more diverse membership may have been a factor. The Academy operates a preferential voting ballot. This means that one film could potentially receive the most votes as members' favourite film - which would give it victory in a first-past-the-post system of the kind employed by others, including Bafta - but still be beaten to the award by another film which had gained a significant proportion of second-favourite choices across the board. La La Land has led the race since it premiered at the Venice Film Festival last August to rave reviews. By the time many Oscar voters saw the movie, some may have felt that after months of superlative after superlative being heaped up on it, it had been excessively hyped. With the current political atmosphere in the United States, many Oscar voters may have thought that this was a time to honour a film that felt like a particularly important piece of work. Excellent as La La Land is, a win for the singing, dancing love letter to Los Angeles may have felt too frothy and self congratulatory. Moonlight, a film about acceptance and struggle, certainly feels like a movie that is more than a simple piece of entertainment. How did the mix-up happen? The Academy has around 6,500 members, and the reasons they will have voted the way that they did, of course, could and probably did vary wildly from voter to voter. The Academy doesn't release voting figures, so there's no way of knowing how emphatic Moonlight's victory was. It could have come down to one vote, it could have won by a landslide. But Moonlight winning against a film that seemed to be a runaway favourite is a huge achievement. And there's no doubt that Barry Jenkins' story following a character from childhood to manhood is a more than worthy winner of cinema's biggest prize. Oscars 2017: How did the La La Land/Moonlight mix-up happen?